wash noodes with warm water. saute macadamia, garlic, salt & pepper about 3 minutes. 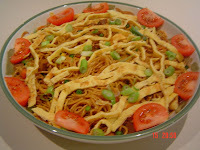 add noodles, beansprout, carrots, peas, (you can add whatever veggies you like), add soy sauce, spring onions. put the lid on, cook until all the vegies tender. stir. serve with fried onion, eggs, and tomatoes. hi ria,i tried this recipe last saturday and it was a hit amongst my guests! so thanks a lot.